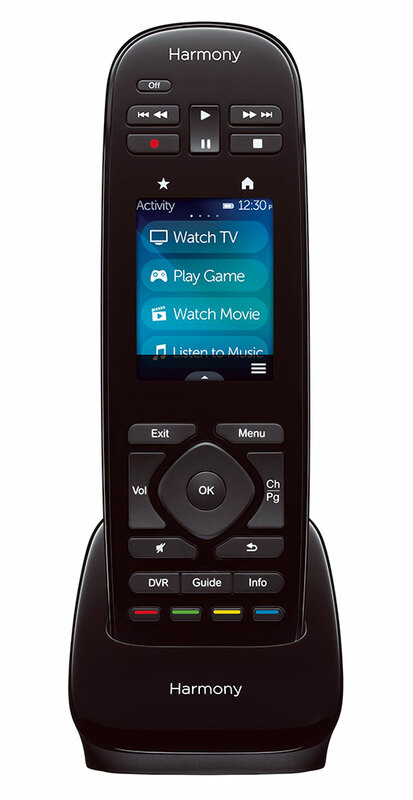 Is Logitech’s ‘Ultimate’ the world’s last true universal remote? Earlier this year, Logitech announced it was making some big changes, not the least of which was an abandonment of its Harmony-branded universal remote control division. It’s too bad, too, because the Harmony line of remotes is generally considered the best consumer-level remote money can buy. The hard truth, however, is that smartphones and tablets are now poised to do what universal remotes never could: make controlling our A/V gear easy. But while smartphone and tablets may spell certain death for remotes as we know them, they aren’t ready to assume control just yet (nor are consumers, for that matter). There’s a gulf to be filled in the meantime; an adjustment period, if you will. That presents Logitech with the perfect opportunity to deliver its swan song: The Harmony Ultimate. The Harmony Ultimate is just as its name implies. It’s everything the Harmony ever got right paired up with all the features consumers have been asking for, but hadn’t gotten yet. Clearly, Logitech intends to go out with a bang. The company has taken some heat through the years over the Harmony’s lack of RF support and gaming console compatibility, and over problems controlling certain cable box functions from certain cable providers – we’re not pointing fingers at anyone in particular (Time Warner), but it’s a problem for a lot of people with built-in DVRs. The Ultimate addresses all of these issues. And then some. And then some more. When it goes on sale for $350 later this month – currently $100 more than the Harmony Touch – it brings with it the proverbial kitchen sink. Logitech invited us to an early-morning preview last week where we took the Ultimate for a test drive with a fairly typical home theater system comprising an HDTV, cable box, home audio system, gaming consoles, and something most intriguing from the folks at Phillips. For starters, the Ultimate offers support for RF through the use of the new Harmony Hub, an accessory that is included as part of the Ultimate package. The Hub can support two mini-blasters, which should be more than enough to cover all of the components hidden behind your media console’s doors. We walked around the room with the Ultimate and it worked just fine from all angles. The Ultimate also includes support for IR, Wi-Fi, and Bluetooth. The Bluetooth feature is important for PS3, Nintendo Wi and Wii U users who desire the ability to turn on their consoles in coordination with the rest of the equipment in their system. Navigating Netflix is also considerably easier now. The Ultimate will also work with the upcoming Sony PS4 and ‘Xbox 720’ from Microsoft, once those two gaming systems are out and the codes have been shared. 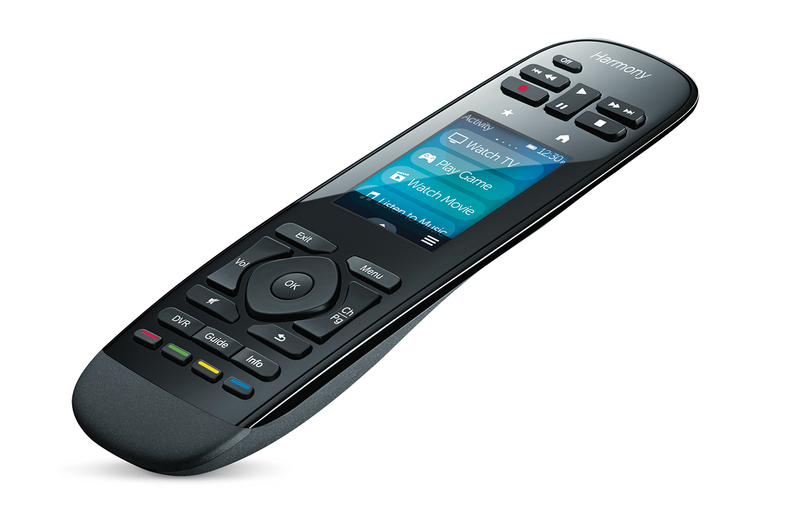 The Logitech Harmony Ultimate has the ability to control up to 15 devices via its 2.4-inch color touch-screen that enables no-look control over television programs, movies and music by using simple swipes and taps. Other exclusive features include vibration feedback (so you know it received your touchscreen commands), tilt sensors, and buttons programmable to execute different commands based on short and long-duration presses, essentially doubling the available functions. To go along with the Harmony Ultimate’s launch, Logitech is also introducing an enhanced iOS and Android app that will allow users to control entire systems with a tablet or smartphone. Logitech demonstrated the app on an iPhone 5 and Samsung Galaxy S III. We were able to use the devices to program 14 swipe gestures (all customizable), access a Time Warner Cable box’s programming guide, and create different favorite-channel listings for multiple users – a feature we think will appeal to parents who may want to have greater control over the content their children can access at the push of a button. One Hub can’t control multiple zones. It can be controlled by multiple phones, and you can control multiple hubs with one phone (but pairing and unpairing is going to be a pain). Also, you cannot add a Hub to your current setup and control multiple zones. It’s a one to one relationship with the remote. But perhaps Logitech left the best new feature for last: support for the unique Philips Hue lighting system. The Hue starter package is $200 and comes with 3 bulbs (rated to last for 15,000 hours) and a base station. If you’ve ever wanted to control up to 50 lights in your home at the same time with almost unlimited flexibility, the Harmony Ultimate/Hue combination is going to rock your socks. The Philips Hue is the world’s first personal wireless lighting system. The Hue LED lights are designed to sync up to a base station that you connect to your home’s Internet router. With Hue bulbs installed, you can still turn the lights on with your regular light switches, but the real fun comes when you control the system with an iOS or Android-based app (available now). Hue LED bulbs are unique in that they can be changed to display different tones of white light – from warm yellow to vibrant blue. But the bulb’s most amazing trick is its ability to recreate any color in the spectrum. How’s it work? Choose a photo already on your smart phone or just take a quick snapshot and use that instead. On the app screen you’ll see pointers that represent each of your wireless bulbs. Simply drag the pointer to a color in your photo and the Hue bulb will change to that color straight away. Not only does it work, but it works really quickly. Logitech let us get our “Austin Powers” groove on and program its test system to turn on the stereo while the lights turned red. Oh behave! 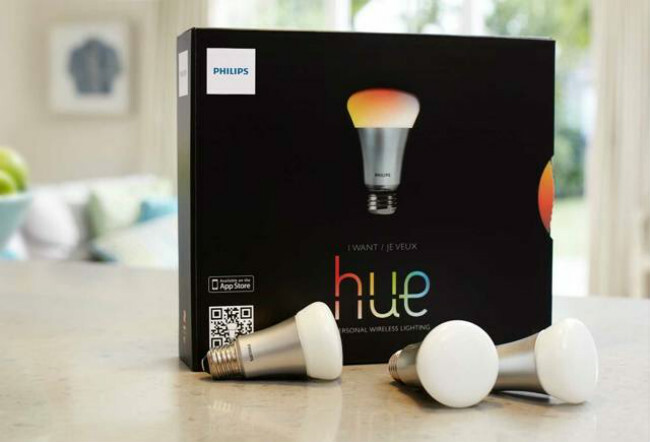 The Hue app allows users such flexibility as to choose favorite light settings for each bulb, program the lights to turn on via a timer; and even program light intensity to gradually increase as you awaken in the morning. Ever gone on vacation and freaked out as you boarded the plane as you realized that you left the house dark? The Hue system lets you program your lights to turn on or off at different times; – you could theoretically program the bulbs in your bathroom to illuminate for short durations and at different times, making it seem like people are home at night. Logitech is also introducing a cheaper alternative to the Ultimate called the Harmony Smart Control which is going to retail for $130. The Harmony Smart works with the same app, but is a smaller remote that comes with a Harmony Hub. Combined with the app on your smart device, you end up with a great second universal remote for other rooms in the house. 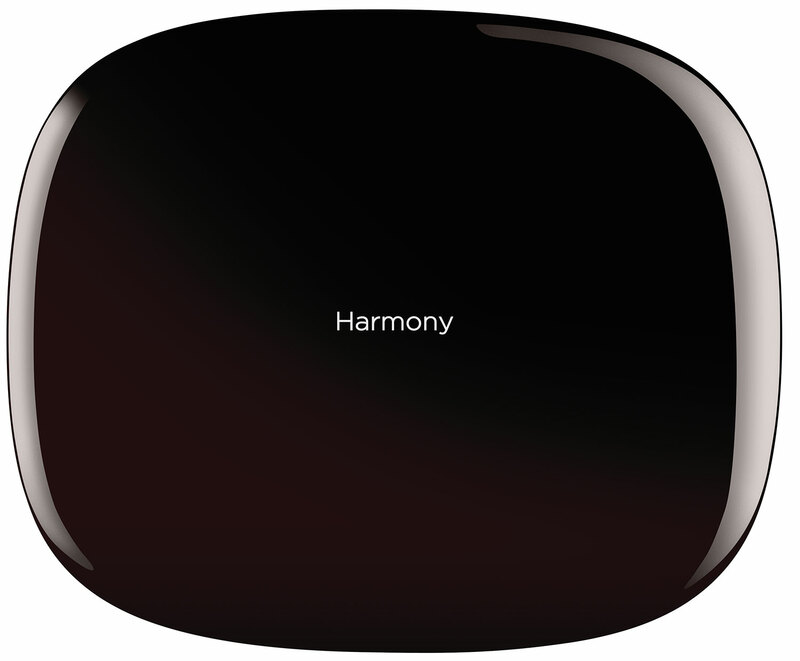 The Harmony Smart, unlike its more expensive sibling, is limited to controlling only 8 devices. But what about your existing Harmony 900 or 1100 advanced remotes? Unfortunately, the Harmony Hub does not work with them – it looks like both are being replaced by the Ultimate. We anticipate a Harmony Ultimate with Hue system will arrive for review soon. Stop back by Digital Trends for a full review on Logitech’s latest.